είμαι δηλαδή της άποψης να ανοίγουμε για κάθε τσάπτερ νέο τόπικ..εξάλλου σάιτ αφιερωμένο στο OP είμαστε. Μπορεί να ανοίγεται νέο τόπικ για κάθε τσάπτερ και τα πολύ παλιά να διαγράφονται απλά. Εισήγησή μου. εγω προτιμω το ενα τοπικ.ειναι ολα μαζεμενα σε μια θεση,κι ολα μια χαρα. τι ένα?τι πολλα?... κανα spoiler για 590 εχουμε? μιναααααααααααααα its here spoilers are here!!!! !κ μου φενοντε ΜΑΜΑΤΑΑΑΑΑΑΑ!!!!!!!!! Shanks: Don’t say that… Even though we were enemies, Whitebeard was a man deserving of my respect. That goes for even Sengoku. Shanks: Luffy, this must be hard on you. I heard Ace’s last actions, and it surprised me. It sounded like something Captain Roger would do. At times I wanted my captain to run away, and sometimes cry. Listen, Luffy… A man becomes a real man after learning both victory and defeat, as well as running and crying. It’s ok to cry…!! But then get over it!!! Villager: It’s Mr Garp!! Garp returned home in a marine ship!! villager: Is it a business trip? villager: Mr Garp! I read the newspaper! villager: What happened to Luffy!? villager: With Whitebeard dead, what’s going to happen to this world! Mr Garp!? villager: For the last few days, we keep seeing pirate ship off the shore…. we can’t sleep at night! village: Oh really! Thank god! Don’t let your guard down just because this is a remote island of East Blue. villager: Mr Garp, we have another problem!! A Mountain bandit came down from the mountain… and is occupying the bar!! Dadan: How dare you show your face here!!! Dadan: You were right there at the war…!!! They were right in front of your eyes…!!! Why did you let Ace die!!!!! Dadan: You chose your duty over your family!? Garp!! To hell with the “Hero of the marines”!! Die, you goddamn old geezer!! Magra: hey, hey, boss stop!!! Makino: Mr Garp wasn’t able to save the two who were right in his arms reach! It shook him more than anyone else!! 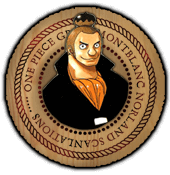 Dadan: ….no… The one that’s most shaken is Luffy!!! Ace: I’m Ace!! Who the hell are you? Makino: Booo! No, “who the hell” is too rude. Luffy: how about “who the heck”? Ace: Who the heck are you? Makino: Hahahaha, no, no that’s not it. You guys aren’t being serious are you? Garp: You know how much he looked up on his brother…!! Makino! Garp: Hey chief… He ran away on a submarine. No wreckage was found…!! He’s most likely alive! villager: thank god! But why is there a bandit…? Dadan: Luffy, that idiot…!! No matter what kind of pirate he’ll grow up to be, I’m always going to be on his side!! My heart is about to shred into pieces just thinking of what he’s feeling right now!! 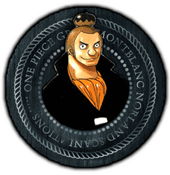 Dadan: LUfffyyy!!! Don’t let it bring you down!!!! Luffy: DAAAAAMNNNIITTT!!!! I am weak! I can’t protect anything!!! Luffy: Go away…!! Leave me alone!!! Luffy: It’s my own body!! I’ll do as I please!!! Jinbei: Well then, Ace’s body was his own as well. Him dying is his own will. Luffy: YOU SHUT UP!!! Any more word out of you, and I’ll beat you!! Jinbei: If that’ll calm you down, you can try. I may be injured as well, but I wouldn’t lose to you in a state like that….!! 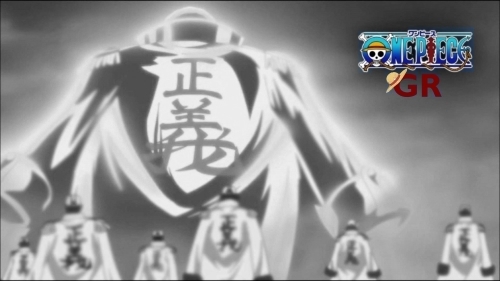 Luffy pwned, grunts, panting, etc. Aohige quote: Thank god Jinbei is there to shut him up. Hopefully he’s get out of this phase fast thanks to grown ups around him. Ace: Jinbei… While I was on route chasing Teach, I came across my brother in Alabasta. I haven’t seen him in 3 years. One look at him, and I knew he was alright. Why do you think that is? Jinbei: Can you not see anything anymore!? Your confidence to climb over any walls! Your own strength you never doubted! Numerous enemies you don’t stand a chance to have faced you, and broken those confidence and belief in strength you had in yourself. And then your brother you looked up to as a guide in this sea..!! Yes, you may have lost many!! Your eyes are being covered by the massive wall called this World!! But you cannot see ahead like that!! You are being swallowed in your own guilty conscience!! Jinbei: It may be hard on you right now, Luffy!!! But you must surpress them for now!! Don’t just think about what you have lost!! What you no longer have, you no longer have!! Reaffirm yourself!! What do you still have left!? I still have my crew!!! Luffy: Zoro!! Nami!! Usopp!! Sanji!! Chopper!! Robin!! Franky!! Brook!! I have… my crewmates!!! Ace: With a clumsy brother like him, I’m always worried about him, you know? Ace: He’s no longer just a little brother Luffy following me around. He had reliable crewmates supporting him. No matter what happens, he’ll be alright. It reassured me. Luffy: I wanna see them right now…. στο Shanks και μονο που το ειδα αυτο πορωθηκα!προβλεπεται μαματο chap!